I hung some elephant chimes from the chandelier for added interest. They also have small cups for candles. This table is full of color. 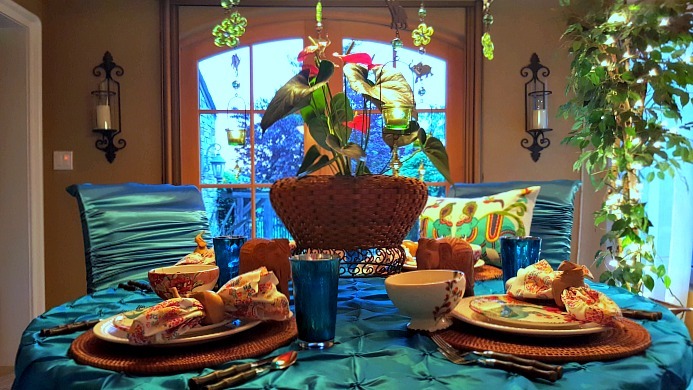 I using a turquoise tablecloth sets the mood, matching the blue in the plates. Even the napkins have elephants on them. The napkin ring is a carved wooden elephant. These small carved wooden elephants are from a HP co-worker. He is from India. We had invited him to dinner one evening, so he gifted us with these cute elephants. My husband is retired from HP. The centerpiece is Anthurium plant - a gift from my parents for Mother's Day. How can anyone resist these sweet elephants? I borrowed these two rose colored lamps from our bedroom. 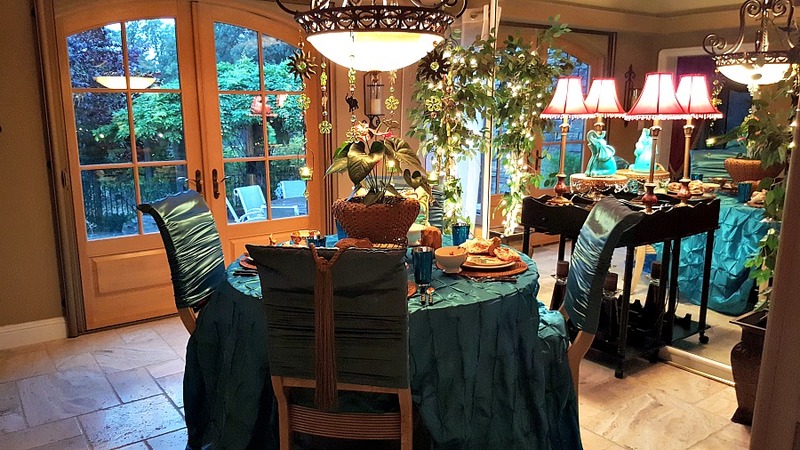 I like the fringe look for this tablescape. The rattan chargers I have had for years. 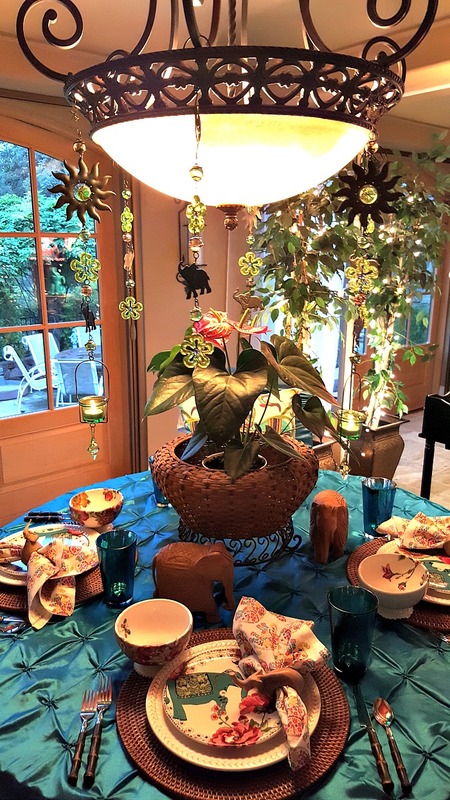 A fun and yet exotic tablescape to enjoy. 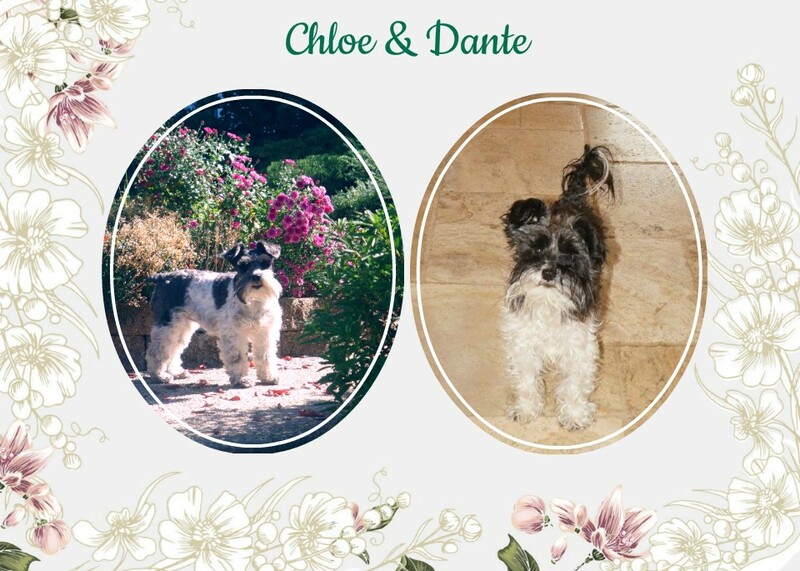 I hope you all enjoyed a very special Mother's Day. The brunch I prepared turned out lovely. We even had leftovers. Ooh I love this. I have always had a fondness for elephants. I had my eye on those dishes too and they look elegant on that pretty tablecloth. Those hand carved elephants you were gifted with are quite a keepsake. 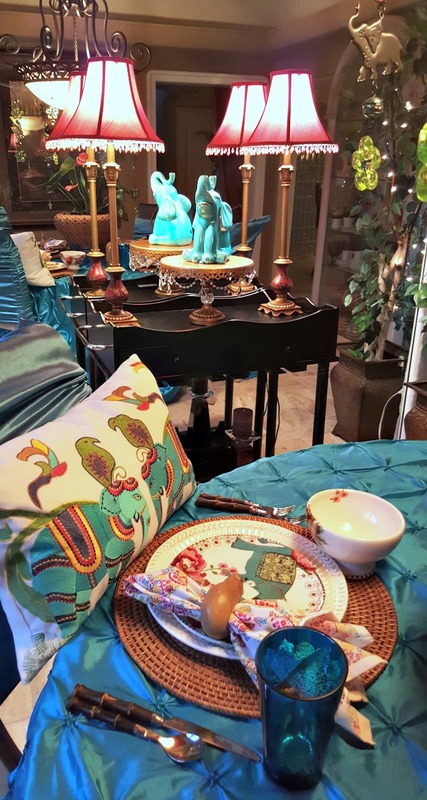 I like the added chimes on the chandelier and the turquoise elephant on the tea cart. The anthurium is beautiful- can you plant it there and keep it going? Love all of the bright colors in this setting! The tablecloth is lovely! "Elephant shoes" has always been a special phrase in our house (look in a mirror and mouth the phrase and you will see why) I still use it with my daughters!! 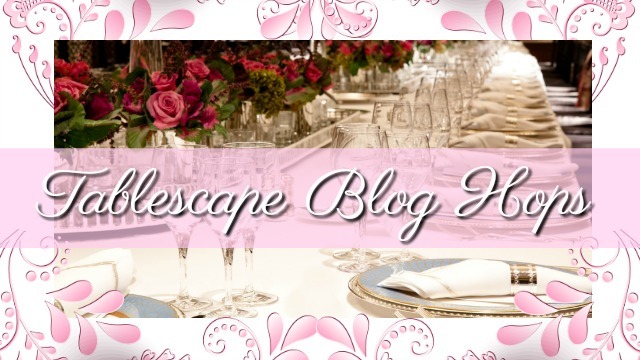 Yes, another unique and pretty tablescape, Linda! Love the colorful elephant theme! Just perfectly gorgeous! I would love to put my feet under a table decorated like that. I'd surely feel like a Queen. Hope all is well with you Linda. 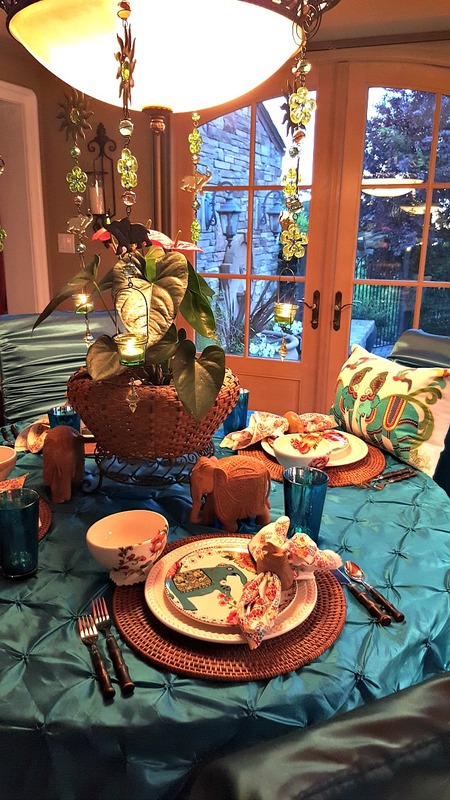 I am crazy over your exotic color elephants Linda, so festive and fun! We have a lot of elephants around our house too, Alabama elephants that is! 🏈 Beautiful table for summer! 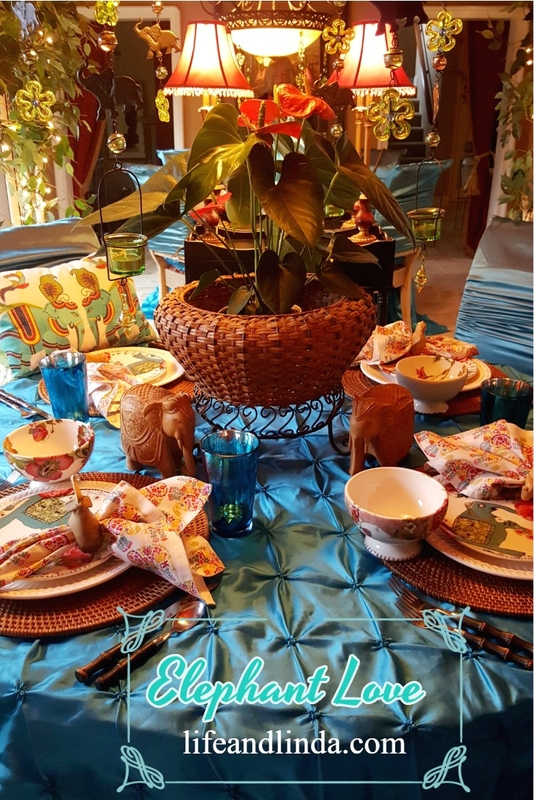 What a fun theme with those great elephant dishes and that gorgeous tablecloth. Pillows, napkin rings, and elephant accessories are darling especially the wooden carved ones. Even cute elephant graphics! 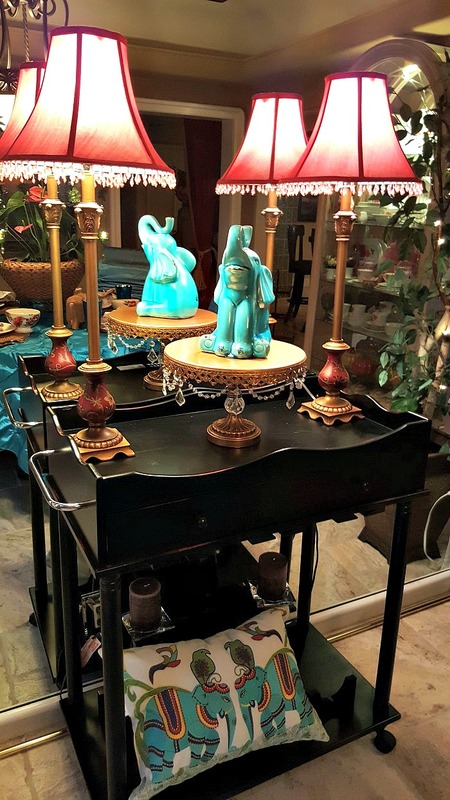 The aqua elephant centerstage on your sideboard is so cute. Well, THAT'S fun, Linda! I love elephants. I just talked to my friend today and she just sold her late husband's elephant collection. He had several hundred of them and she sold the lot of them to a collector. 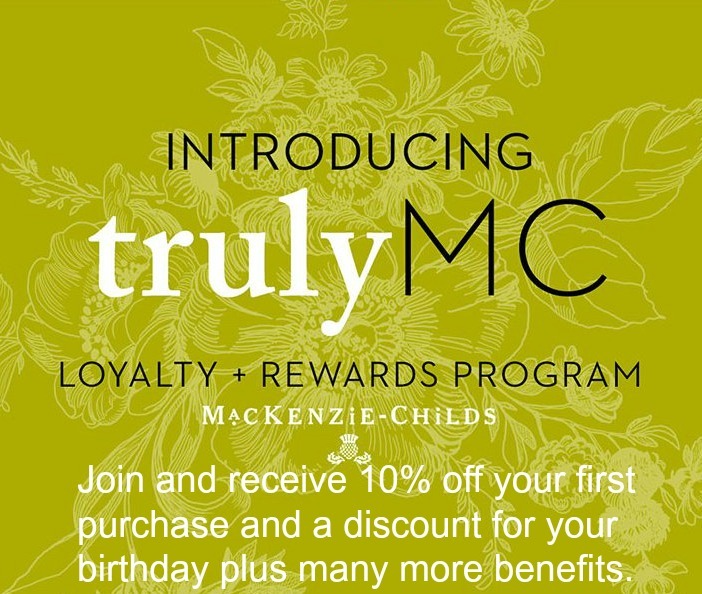 I wish I had known she was going to do that because there is one I would have loved to have that he was going to give me when I visited next time. Just a small stone one..but...it is what it is, isnt' it? So, so beautiful , elegant and gorgeous... 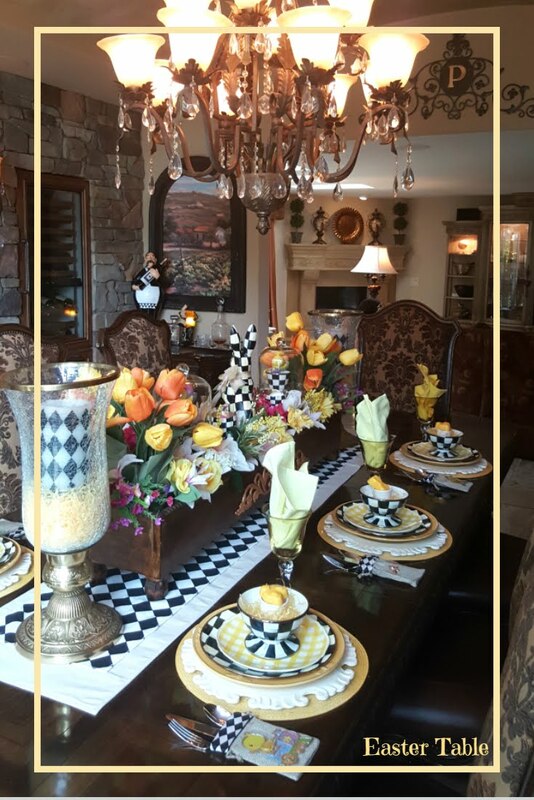 I love your decorating ideas..
Linda, what a wonderful tablescape with these beautiful colorful elephants. Our elephants around here are red and white, Crimson Tide. Gorgeous blue clothe makes the dishes pop. 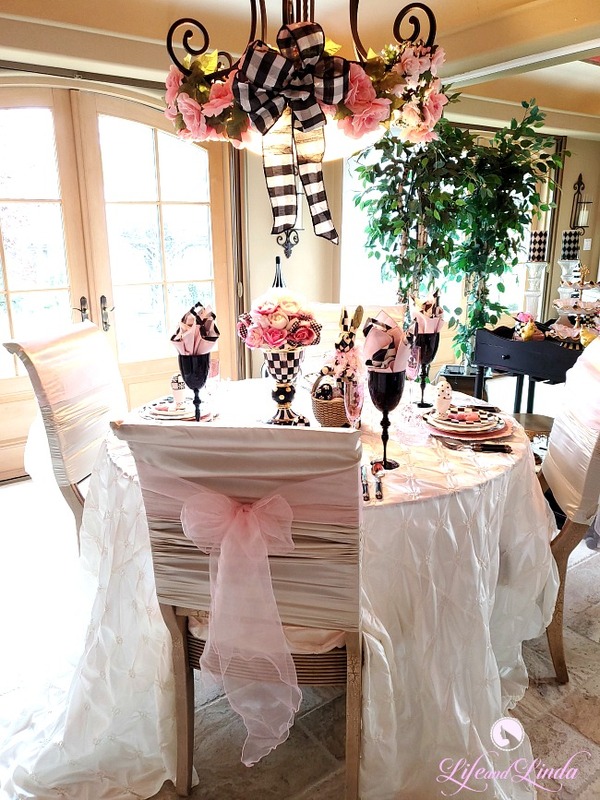 Your elephant themed tablescape looks beautiful, Linda. I also have a couple of those anthurium plants, which I love. I'm happy to hear that your brunch was lovely. I hope your dear dad is doing well. P. S. My late Beloved took an early retirement from HP. 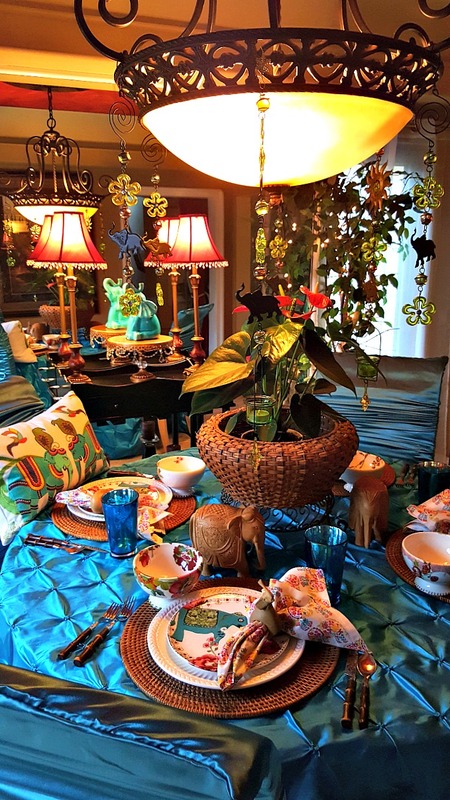 Linda, I absolutely love your table...the colors are beautiful. 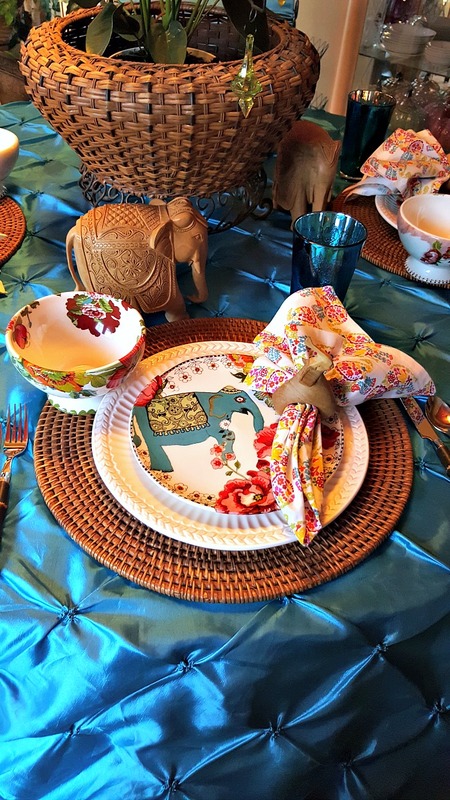 The elephant theme is so perfect and the elephant plates are so exotic. 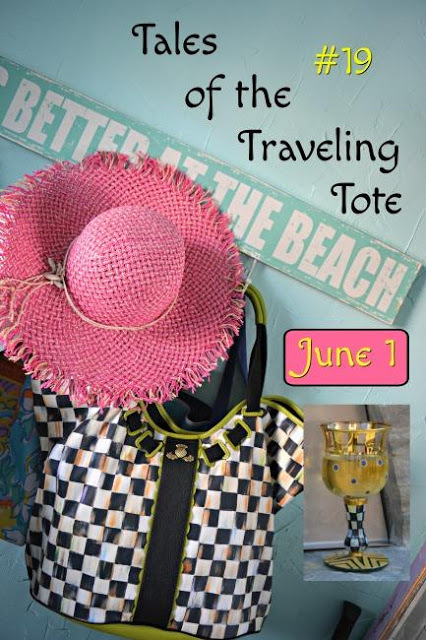 I would love to sit and talk about traveling! 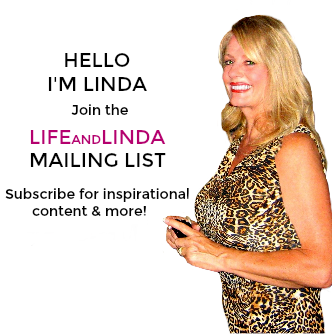 What a fun theme, Linda. I love the colors and those adorable plates. Fun in every detail! Over the top BEAUTIFUL! Everything is amazing. The most lovely dishware, plate stack, and amazing accessories. I love that basket holding the plant. The Elephant's are wonderful! I LOVE elephants too and have several in our home too! 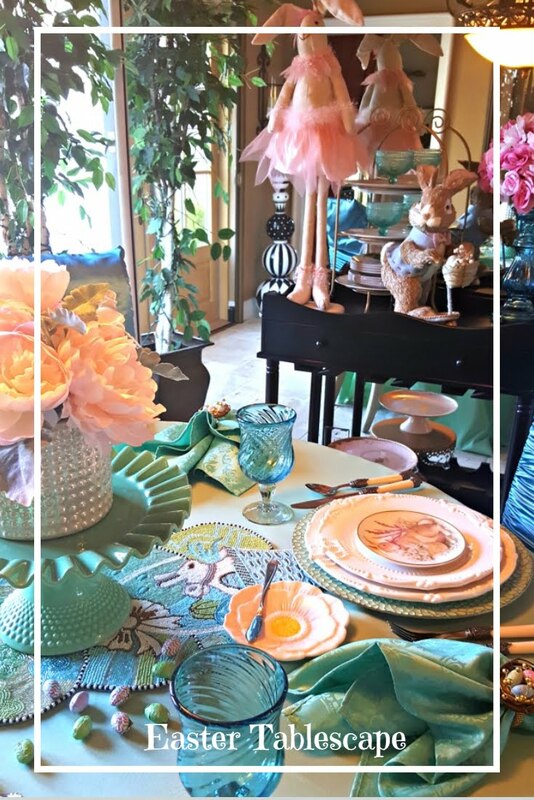 Love this table, the plates and napkins are so bright and pretty. It all just makes me smile! Love the contrast of the brown and the blue. It's gorgeous Linda. I have those same plates! I only bought a couple of the bowls, but this makes me want to pick up a few more! I love the cloth and the napkins you used! Thanks so much for sharing at Celebrate Your Story!